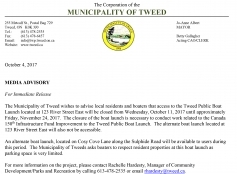 The Municipality of Tweed wishes to advise local residents and boaters that access to the Tweed Public Boat Launch located at 123 River Street East will be closed from Wednesday, October 11, 2017 until approximately Friday, November 24, 2017. The closure of the boat launch is necessary to conduct work related to the Canada 150th Infrastructure Fund Improvement to the Tweed Public Boat Launch. The alternate boat launch located at 123 River Street East will also not be accessible. An alternate boat launch, located on Cosy Cove Lane along the Sulphide Road will be available to users during this period. The Municipality of Tweeds asks boaters to respect resident properties at this boat launch as parking space is very limited.